This could be an okay option for simple anonymous browsing with the free client, but we wouldn't recommend you give ZPN any of your hard-earned cash. 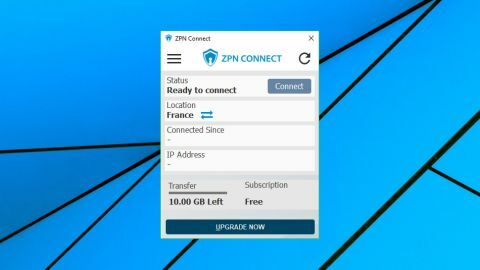 We like VPN companies to offer a free account of some kind, and ZPN's is better than most with a generous 10GB monthly allowance. Sure, there are only seven locations across Europe and North America, a single connection allowed, and absolutely no P2P support at all, but if you're looking for basic anonymous browsing this might easily be enough. The Mobile plan improves this with unlimited bandwidth, 30+ locations, a 50GB monthly quota and P2P allowed in "premium locations" (eastern Europe, India, South Korea, Vietnam). It's still only covering one device and one connection, but at $2.99 for a single month, or $1.99 if you fork out for a full year, it makes cheap cover for short trips. The top-of-the-range Premium plan gives you unlimited data and support for five simultaneous connections. It's more expensive, but still reasonable at $9.99 billed monthly, $5.99 on the annual plan. Choose a plan, you're able to pay with PayPal and Bitcoin (the website didn't have an option to pay by card, when we checked), and the company offers a 7-day refund if you're not satisfied with the service. Most VPNs love to boast about how seriously they take your privacy. ZPN tries to do the same, although the headline it uses - 'No Private Information Share' - isn't quite as clear as we would expect. That's good to know, although it's not clear if this is solely relating to the signup process, or that it also applies to your use of the service. That also looks good, although the effect was spoiled a little when we realized the text was almost identical to a boilerplate paragraph used by many smaller VPNs. Don't take our work for it; enter the final sentence into Google - "There are hundreds of good reasons for being anonymous and we respect them fully" - and see how often it turns up. Using someone else's text doesn't prove a VPN is doing anything underhand, but it doesn't give us any confidence that those words truly reflect company procedures, either. And in a business as dependent on trust as a VPN, that's bad news. The last time we reviewed ZPN, we were unable to download the Windows client due to a revoked server certificate. Not a great start for a security company. There was a smaller website issue, this time, too, although it was easy to figure out. The site wasn't properly redirecting HTTP requests, so simply entering zpn into our browser address bar took us to http://zpn.im, which displayed a blank page. We had to explicitly enter https://zpn.im to be taken to a working site. Not difficult, but again, it looks very unprofessional. Once we found the site, downloading the Windows client was easy, and we were able to set up a free account in a minute or two by handing over our email address. Our client defaulted to the French server, and tapping Connect got us connected within a few seconds, started a 'Connected Since' session timer and displayed our new IP address. A desktop notification made it clear when we connected, though not if the connection drops. The client will reconnect automatically by default, but there's still a chance you could be left unprotected for a few seconds at least, perhaps more if the reconnect attempt fails. There's no list of servers on the main screen, and it's not immediately obvious how to find this. After exploring, we realized that a graphic to the right of the server name also doubled as a button, and clicking it displayed your server choices. It's not that difficult, although we're struggling to see why the developer didn't just use a regular button. The location list is very simple, just a list of servers, with a caption of 'P2P' for your torrent-friendly options. There's no Favorites list or any other way to group commonly-used locations. The client has a lot of settings (include a kill switch and reconnect options), but we suspect most users won't be clear on what they all do. The 'DNS Leak Fix' option is captioned 'auto set all adapters DNS addresses', for instance. A 'Gateway' option defaults to 'Use api if Google is blocked.' A VPN Protocol list enables choosing between AntiDPI, OpenVPN and SSL VPN. Puzzled? We were, too, but there's no help bundled with the client. Tapping a Support menu item takes you to the website, where there's a basic FAQ, but nothing more. BBC iPlayer prevents access from non-UK IP addresses by default, and the service also detects and blocks many popular VPNs. This can make it a challenge to view, but not for ZPN - even the free UK server allowed us to stream whatever we wanted. It was much the same story with US-only YouTube content, where even the free US server gave us instant access. ZPN couldn't unblock Netflix, unfortunately, and the platform displayed its usual 'streaming error' message, no matter what we did. Some providers will actively work to fix this, use new ranges of IPs and maybe enabling viewing a blocked site, again. There's no sign of any commitment to do this on the ZPN website, though, and with its blog and Twitter feed being inactive since early 2016, this doesn't look like a company that's doing very much. Our performance tests returned disappointing results for ZPN's free account, with our nearest UK server managing just 5-10Mbps, and US connections fighting their way to a miserable 2-5Mbps. The problems continued as we ran further tests. IPLocation.net suggested the free US server was actually in Canada, for instance, making it relatively useless for unblocking websites. DNS leak protection isn't turned on by default, perhaps an issue for inexperienced users who aren't aware of the problem (especially as there's no real help or documentation to explain it.) But once we turned it on, the client successfully replaced our regular DNS. Speeds improved when we upgraded to a paid account, although not always enough. UK connections rose to 20-25Mbps, enough for most tasks, but around a third of what we would expect from our 75Mbps broadband line. US speeds were an equally disappointing 15-20Mbps. But there was just a little consolation from some of the most distant locations, with Singapore giving us 20-25Mbps, and Australia averaging 15Mbps, better than we've seen with many competitors. ZPN performance is poor, support is rubbish, and a Twitter feed which hasn't been touched since 2015 leaves us thinking none of this is going to change any time soon. The 10GB free plan might be worth a try for basic browsing, but think very carefully before you give the company any money.